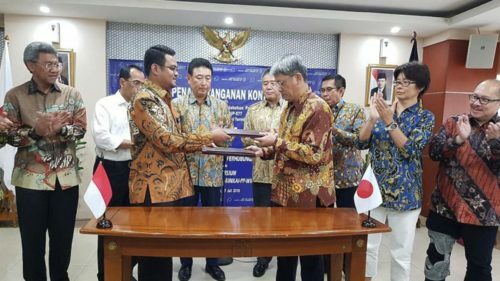 Indonesian Transportation Ministry official Aditya Karya and representative from the Indonesia-Japan consortium Hiromu Shinoda exchanging contracts of the Patimban Port project in Jakarta on Friday. 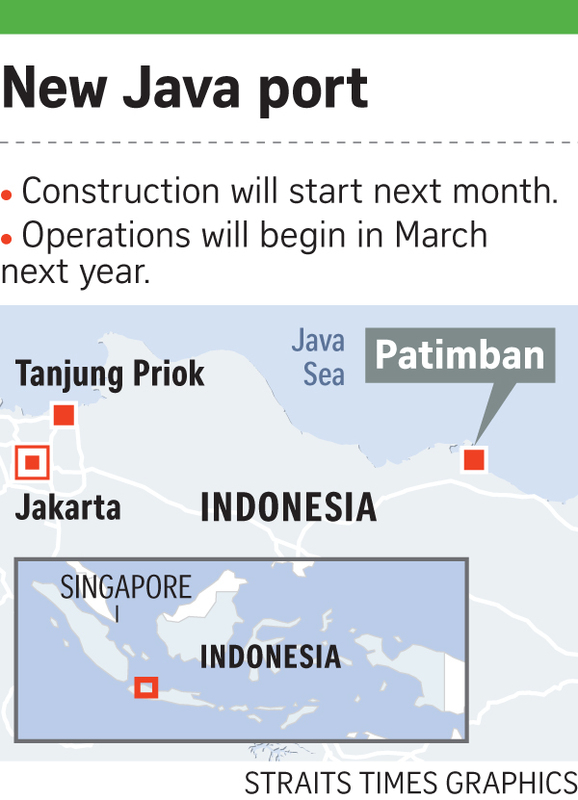 Indonesia will kick off a 43.2 trillion rupiah (S$4.1 billion) project to develop Patimban Port in Subang, West Java, next month to improve its poor logistics performance and become a transhipment hub. Transportation Minister Budi Karya Sumadi said on Friday the Japan-backed project will be vital to ease movement of goods within and across the country's borders. "We really want to increase our competitiveness and lower our logistics costs through better services. That's why this is an important project," he said during the signing of a contract agreement on the project. Under the contract, the project will be executed by a consortium of five companies - Japan's Penta-Ocean Construction, TOA Corporation, Rinkai Nissan Construction, and Indonesia's PT Wijaya Karya and PT Pembangunan Perumahan. The new port is slated to commence operation early next year, beginning with a car terminal and a ferry terminal, Mr Budi added. Patimban Port, located near some of Indonesia's key industrial areas - Bekasi, Karawang and Purwakarta - is set to reduce heavy congestion at Tanjung Priok Port in North Jakarta that now shoulders most of the international trading activities. The project is part of President Joko Widodo's infrastructure push to boost connectivity in the world's largest archipelago of more than 17,000 islands, where logistics costs are high, and also an attempt to make the country a rival to Singapore as a transhipment hub. South-east Asia's largest economy jumped 17 places in the World Bank's Logistics Performance Index 2018 to 46th position out of 160 countries, but still lagged behind some of its Asean peers - Singapore (seventh), Thailand (32nd), Vietnam (39th) and Malaysia (41st). The Patimban Port development will run in three stages until 2027. The port will be able to handle containers of 3.5 million twenty-foot equivalent units (TEUs) when the first stage is completed. Its capacity will be expanded to 5.5 million TEUs in the second stage and then 7.5 million TEUs in the final stage. Indonesia has so far secured a 118.9 billion yen (S$1.46 billion) loan from Japan, covering nearly 83 per cent of the total costs in the first stage.